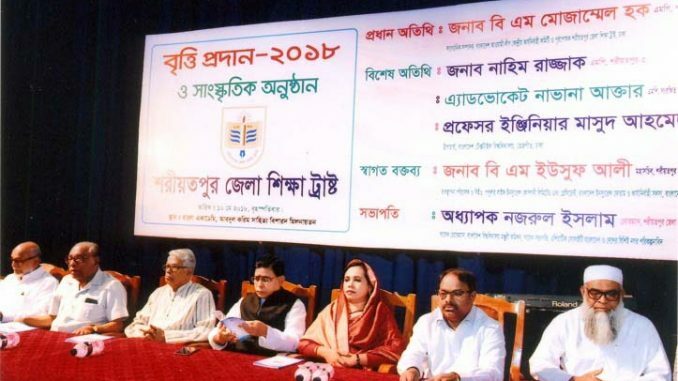 Shariatpur District Education Trust will give scholarship to the meritorious and distressed students of the district. Shariatpur District Education Trust will provide scholarship to meritorious and poor students of Shariatpur district for the academic year 2018 - 2019. The permanent residents/students of Shariatpur district, who are studying in a government-approved educational institute will be able to submit this scholarship. Students who received the Golden GPA 5.00 in the SSC and HSC exams of the year 2018 will be able to apply for this scholarship. 1. You must write an application form by hand or computer compiling. 2. The applicant must have the recommendation of the head or departmental head of the current educational institution. 3. Certified attested photograph and photocopy of SSC / HSC / equivalent examination paper, 1/4 passport size certified colored photograph with application letter, attestation letter regarding the study of institutes / departmental head of the SSC / HSC / joint head of the local union council / municipal mayor / commissioner, directly or by email to Shariatpur District To be credited along with the Education Trust. Students will be able to submit applications for scholarships up to January 30, 2019. Detailed information about scholarship can be known at 01914920973 .